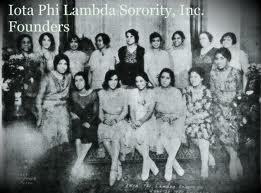 Iota Phi Lambda Sorority, Inc. The turn of the 20th century was a tumultuous time for the United States. Within a few years of the start of World War I, there was the Great Migration of Blacks from the South to the Northern cities seeking greater opportunities and a more tolerant society.These changes underscored the need for Blacks to learn new skills. These skills, in turn, would hopefully ensure a better way of life for tens of thousands of Blacks that had migrated northward. Lola M. Parker, a graduate of Chicago Business College, was one of the great visionaries of this time. She realized that Black women who were discriminated against on the basis of both race and gender needed to not only improve their existing skills but also motivate and inspire other women to achieve the highest level of proficiency in their chosen professions. Joining together with Ethel T. Edwards, Mildred G. Hardin, Harriet M. Robinson, Ophelia Harrison, Burdette Trigg and Marjorie Tyndall, Lola M. Parker founded Iota Phi Lambda Sorority on June 1, 1929 to carry out these objectives. however, the main focus remains on the field of business. There are now more than 100 chapters with membership numbering more than 9,000 in 85 cities,Washington DC and the US Virgin Islands. For more information please visit www.iota1929.org. Copyright ©﻿ 2018 The Epsilon Omicron Chapter of Iota Phi Lambda Sorority, Inc.. All rights reserved.